Safely remove coffee, tea, cola, natural colored fruit juices, grease, oil and smokers tar. 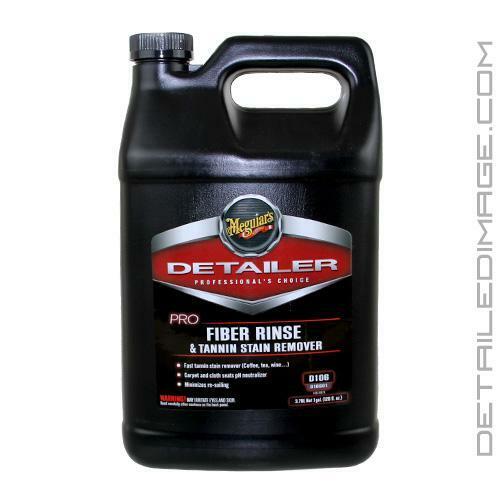 Meguiar's Pro Fiber Rinse & Tannin Stain Remover D106 is a specially formulated fabric cleaner that quickly removes tannin stains (coffee, tea, wine, etc.). Tannin stains are considered coffee, tea, cola, natural colored fruit juices, grease, oil and smokers tar. According to Meguiar's, 74% - 79% of all soils are made up of sand, clay/dirt, carbon, plant and animal matter (i.e. human hair, skin cells, etc). These soils can be easily removed with a vacuum and dry brush, however the remaining percentage of soils attach to fibers via fluid and must be dissolved with a liquid for removal. This is where the D106 comes in handy! Simply spray this cleaner onto the stain, let it dwell, and using a microfiber cloth or brush wipe clean. D106 will quickly remove the stain, while having two other great benefits. D106 will help pH neutralize your carpets after the use of a strong cleaner and it will help keep them from becoming re-soiled in the future. You can use D106 at full strength for heavily soils, or diluted up to 20:1 for lighter soils. Looking to remove milk, food, organic matter, vomit, blood, grass, juice, urine and other protein stains? Than the Meguiar's Pro Protein Stain Remover D116 is your choice. If you are looking for a carpet and fabric cleaner to help remove heavy tannin stains, pick up your bottle of the Meguiar's Pro Fiber Rinse & Tannin Stain Remover D106! For more in depth cleaning instructions check out the Meguiars Professional Carpet & Upholstery Cleaning Process chart in the Product Downloads section below! Meguiar's Pro Fiber Rinse and Tannin Stain Remover is specially formulated to quickly remove tannin stains and pH neutralizes carpet and seats after using Meguiar's All Purpose Cleaner. Will minimize re-soiling of fibers too! Dilution: RTU - Tannin stain and water stain or browning removal. Up to 20:1 extractor or spray application. Directions: SHAKE WELL. For best results, apply to vacuumed and dry brushed fibers. Apply Meguiar's Pro Fiber Rinse and Tannin Stain Remover(D106) directly to the tannin stain using the 16oz dispenser bottle(D9916). Pull the nozzle up at the first position before dispensing the product. Using a carpet brush, wrap with a cotton towel for carpet applications and wrap with a Meguiar's Ultimate Wipe (M9910) for all other fiber applications. Bonnet clean (wrap towel around brush) the stain or use a tamping method (lay towel over stain, pound brush firmly with a succession of blows on towel where stain exist), rotating the towel when soiled. Repeat steps 2-3 above until desired results are achieved. Mix up to 20:1 (up to 6 ounces per gallon) with clean water in your solution tank or trigger sprayer. Extractor - Follow extractor manufacture instructions to rinse the fibers. Spray Application - Spray onto surface and back brush (drag the brush over the surface) to neutralize the fibers. Professional Tip: Best to use Pro Fiber Rinse and Tannin Spray Remover(D106) first (spot clean/RTU), then Meguair's All Purpose Cleaner to the entire carpet or section. Follow up with D106 (20:1) for neutralization. I cautiously say "yes" to buying this product again, because of the price obviously. It's one of several products we use on stains and it's certainly the last one of the group we try. Not sure if that gives an ideal example of what kind of stains the Pro Fiber Rinse & Tannin is best at removing. But, when I've tried it on stubborn stains, ones that my other products have not been able to remove, it has done very well. So in the end, it's nice to have it on hand for that unusual stain, but I'm not going to use it on a regular basis. It's just too pricey!